Transform your effectiveness and results through training in this fast to learn and easy to use coaching tool for busy managers and coaches. Managers find this approach improves performance – their own and their team members’. Experienced coaches use it to move coaching from transactional to transformational in rapid time; new coaches acquire a structured, practical and effective coaching tool. New skills to support others to get results – and fast! A simple, step by step guide to how to coach quickly and effortlessly and get amazingly better results at work. You too can join the fast growing band of forward-looking organisations that are actively using the Five-Minute Coach to improve engagement, develop their people and create a coaching culture. They are reporting increases in productivity, a happier workforce and measurable improvements in results – and all from some simple but powerful coaching questions. Our in-house Five-Minute Coach training programmes are designed to suit leaders, managers and supervisors as well as HR and L & D specialists and internal coaches. Programmes will be structured to suit your needs and can include face-to-face workshops and/or online work. The Five-Minute Coach can also be incorporated into a longer Leader as Coach training or certified professional coach training. In-house Five-Minute Coach training is guaranteed – your money back if you’re not satisfied with the outcomes. Interested in satisfaction-guaranteed training for your organisation? Our face-to-face open training includes a practical one-day workshop, follow up online development clinics, further practice and reading. Next workshop: London, 5th February 2019. £215 +VAT – includes a free copy of The Five-Minute Coach: Improve performance rapidly. Our on-line programme, includes four practical 90-minute webinars, an observed practice session plus follow up online development clinics, further practice and reading. £195 + VAT – includes a free copy of The Five-Minute Coach: Improve performance rapidly. Online training dates being planned. Please contact us for details, including your time zone. Would you like to train to become a Five-Minute Coach? Or register for the Discover the Five-Minute Coach webinar? Contact us to find out more or register. It really helps with getting true clarity for the individual about their issue and a depth of thinking in the exploration of it. Liz Macann, Head of Executive, Leadership and Management Coaching, BBC. It’s the one training you should do. It will revolutionise how you work. 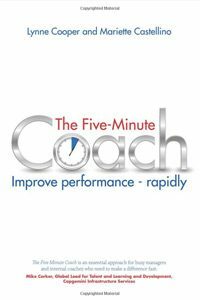 The Five-Minute Coach is a fantastic course to help coaches get results quicker and with precision. It’s so simple, yet so complex – it’s genius! The training was very enjoyable and has proven to be of great benefit to the entire Company. I would highly recommend the Five-Minute Coach to everyone in business.